After seven years it was decided that the market leading Vortex Diamondback range needed an upgrade and 2016 has seen just that. Price versus performance has been fully maintained but aesthetically the new sleek new look has already drawn compliments without taking into account that this makes them really comfortable to hold. 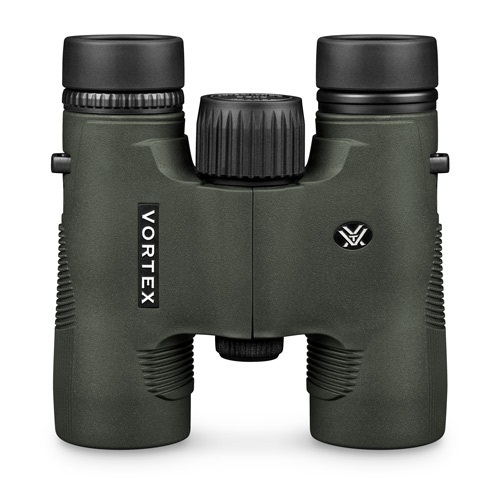 An all new optical system with enhanced dielectric fully multi-coated lenses serves up stunning views and impressive low-light performance, critical attributes in any binocular but very attractive in a medium to low priced binocular. They not only feature an ultra-wide field of view but also superior Argon gas purging for protective fog-proofing and of course waterproofing. Add a rubber-armoured body and twist-up eyecups and nothing has been missed in the new 2016 Diamondback. Dielectric Coating: Multi-layer prism coatings provide bright, clear, colour-accurate images. Waterproof: Optics are sealed with O-rings to prevent moisture, dust and debris from penetrating the binocular for reliable performance in all environments. Fogproof: Superior argon gas purging prevents internal fogging over a wide range of temperatures.